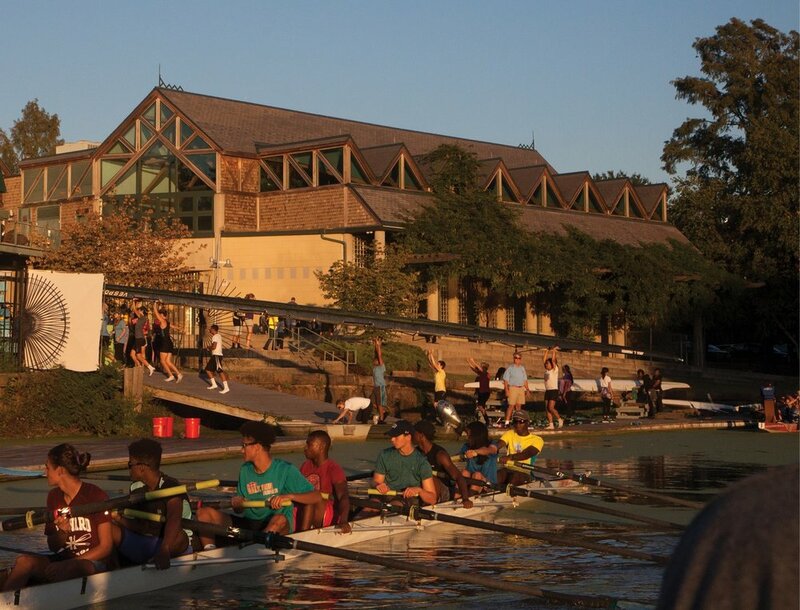 Tucked between Philadelphia’s Lloyd Hall and Fairmount Rowing Association is one of the newest–and most innovative–rowing clubs on Boathouse Row. Now in its seventh year, Philadelphia City Rowing serves the area’s inner-city middle schools and high schools and blends rowing and academics to spur a college-entrance rate that is unusually high; in 2016, 100% of the seniors that were active in the program were accepted into four-year colleges. Founded by Libby Peters, Tony Schneider and Catherine Reddick, Philadelphia City Rowing is privately funded and works in concert with the City of Philadelphia to maintain the outdoor footprint used to house the program’s equipment at the eastern-most end of Boathouse Row. During an afternoon interview near their launch dock, Dougherty watches over her program like a mother bear. She seems to know every athlete by name, “Jasmine, come here for a minute, please,” she calls, as she introduces me to one of the senior coxswains on the team. The rowers that are milling about the dock area as Jasmine heads toward us are as diverse a group of rowers as I’ve ever seen. Jasmine Butler is a senior at The Academy of Palumbo and is aiming to cox in college. She tells me that after rowing during her freshman year she switched into the coxswain's seat because it suited her better. Watching her cox a boys eight on the Schuylkill River during practice, I see that she has a discerning eye, able to pick out the needs of each seat, and unafraid to call on the boys who are rowing in her boat to make changes. Dougherty, a long-time athletics administrator, used her contacts at Temple University to partner with their aquatics department. Temple agreed to provide pool time and lifeguards. Now, Philadelphia City Rowing runs a Swim-to-Row program so every student who wants to row can learn to swim first. “Swimming is a life experience for them. The lessons build confidence, which comes out when they get into a boat." The coaches at Philadelphia City Rowing are as diverse as the rowers. 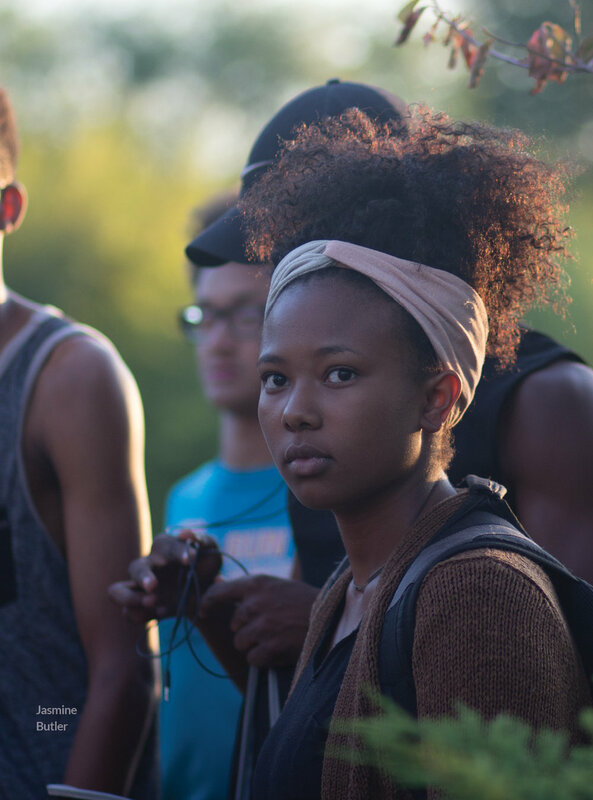 Imani Johnson is a Temple University student doing an internship, coordinating events, working in the office and coaching in the afternoons. Johnson says it's like coming home; she rowed for PCR in high school. Richie Fredericks and Ryan Rickus, two of the boy's coaches, trail the eights as they row by sixes. I sit behind them, their ponytails flowing in the wind. As trailblazers know, others may not be ready, but the trail is still being blazed. Nina Sponheimer, a coxswain who attends String Theory High School and has coxed at PCR for three years, spent last summer at Vesper’s high performance camp with the Junior team. Opportunity does create opportunity; Philadelphia City Rowing is a testament to that. As the sun dips behind the Philadelphia Art Museum, the boats head back to the PCR dock. As boats come off the water and oars are stowed away, coaches hand out bus and rail tokens and granola bars for the ride home. Dougherty tells me they have special passes for the students that allow them to ride public transportation after 7:00pm. I survey the outdoor racks that make up their outdoor facility. Racks and bins and storage units are in the shade now. Tomorrow is an academic day for these rowers; they’ll be in the indoor facility PCR maintains for academics, workshops and winter training. I think back to what Rickus told me, that some folks aren’t ready for PCR to be seen as a force in the rowing world. But maybe that’s too short of a goal. With a fully-funded athletic and academic program, success rates of 100% on-time graduation and 100% college acceptance for their athletes, Philadelphia City Rowing already is a force in the world, and not just the rowing world. Complete information about Philadelphia City Rowing can be found on their website at www.philadelphiacityrowing.org.